It may be getting cooler outside, but that hasn't diminished the chance of a small grassfire growing into an out-of-control wildfire. 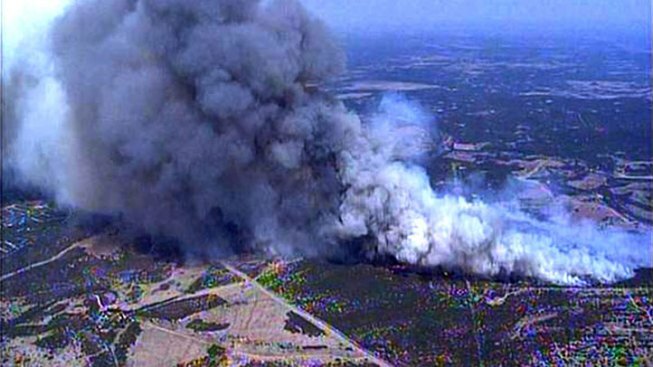 The Texas Forest Service said Saturday that strong winds and low humidity in the Texas forecast, combined with dry vegetation, continue a critically dangerous situation where wildfires continue to be a very real threat. Most of the state, and all of North Texas, will be under a critical fire watch until 9 p.m. Monday. Since the fire season began last November, the TFS and Texas fire departments have responded to more than 20,631 wildfires that have burned more than 3.5 million acres. Firefighters are currently fighting 12 large fires across the state, including the 6,600-acre 101 Ranch fire near Possum Kingdom Lake. That fire, at last report, was 60 percent contained. The TFS is urging all Texans to obey burn bans (251-254 counties are under a ban) and use caution outdoors this weekend, especially when doing anything that can cause a spark. Additionally, for information about how to protect your home from wildfire, visit the Texas Forest Service website.